Thanks for the wonderful design advice Melissa. I love that turquoise piece in the first photo! Love what you did with the room. I really like the way that you break it down into manageable segments. It is much less overwhelming that way! I love how you broke the room up so that it could be used for multi-purposes! You come up with the greatest ideas. Someday you definitely need to put this all together in a book. You are so good at what you do. I love this. You have such a great way of solving both organization and design dilemmas. I like to solve decorating problems in the most simple direct way. Usually the issues we have end up being not so much of a decorating problem as an organization or function problem. Once you address those issues, things usually look better and then it is easier to decorate. :-) I like small manageable chunks for my simple mind. what is so neat about this piece you did is it helps especiallt when the room is larger…I find a larger size room daunting but even a large room can have separate spaces in it..seeing your exMPLE lets us see how it is done-thanks! I enjoy your blog so much. I don’t know that I could get through my design studies without fabulous and educational posts such as yours. Thank you! Spring has sprung in Missouri! We are so happy to see our gardens beginning to wake up! Time to do some work on our outdoor rooms. What lucky kids. You can just see how this really “works”! I love that first picture…..sigh….. Thank you for that great advise! This is what I love…the nuts and bolts practicality! Thank you! Your clients must adore you – a wonderful eye and a spiritual approach. Having you for a blogging friend is like having our own personal decorator/designer…..Many thanks for all your help! Great advice – I love before and afters!! As always, you’ve given some great tips! And what a darling armoire your client has! 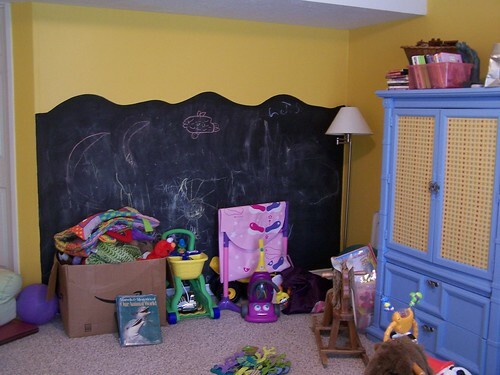 I’ve got to do some reorganizing in my childrens’ rooms too! But I guess it must be a day for childrens’ room posts because I’ve got one of my kids rooms on today too! This is great advice! I’m going to apply it to all of my spaces and define the purposes. Then I will have a much clearer idea of what needs to be done and will tackle the easiest first. Thanks! I want that conservatory type room in the first photo. It is gorgeous. Thanks for the great tips. you are always so inspiring Melissa!!! thank you again and again! Finally updated my blog love list and added you – hope you don’t mind! Wonderful advice. I love the before and after photo’s. And…that hutch! Love that color! The photo of the sun room is spectacular. I could use a room like that just about now…full of sun and beauty. so super cool! i LOVE your blog. i work at domino mag and have just started my own design blog, http://www.urbanfleadesign.com. i linked to your site, and would be forever indebted to you if you did the same for mine! in the meantime, keep up the awesome work and cheers! Melissa – Such common sense solutions – this is really something we can all use – it’s easy to remember and apply and the results are practical and beautiful! Thanks for the great tips and the befores and afters – LOVE befores and afters!!! What a wonderful post! You are not only a very talented designer, but you also explain and show things so well. That is not an easy thing to do! It’s amazing how much children respond to their environment. I think they (just like us grown-ups) get overwhelmed when there isn’t some sense of order. You did a great job defining the areas! And that periwinkle armoire is A-DOR-ABLE!